A bride to be and clueless about saris? You’ve been saved! 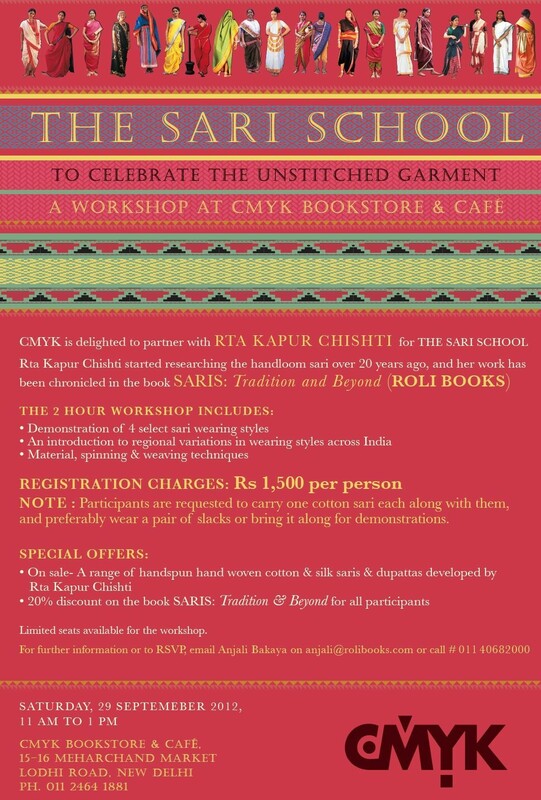 To further add to (or should I say – begin) your sari literacy, the same bookstore is hosting a Pecha Kucha sari event on 28th September (a day before the workshop) starting 7.30 pm. There will be guest speakers talking about the evolution of the sari, and there will be refreshments. Entry is free for this event. For further details, you can go through brownpaperbag’s post on this. What are you doing to improve your sari-literacy? This sounds like fun! I would have totally signed up for it had I been in Delhi by Sept 29. Put up a posting if you do go! Oh, this sounds so interesting! might go!! I must find somebody in Mumbai. Thank you theDelhibride for alerting me in advance! Next article I am SO angry. Literally.